All our spray booth engineers are Gas Safe registered, PASMA and IPAF certified and trained and continually assessed in-house following our comprehensive training programme. This ongoing training of our spray booth engineers ensures that anyone working on your spray booth equipment are skilled and qualified. 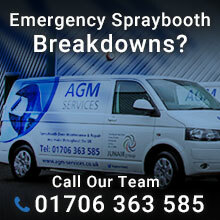 Here at AGM Service we pride ourselves on offering a high quality and reliable service. This philosophy has seen us grow over the last 25 years to become the UK’s leading Spray booth Service and maintenance provider. Our service centres are strategically located throughout the United Kingdom, allowing our fleet of spray booth engineers to respond quickly to emergency breakdown calls nationwide, all at competitive prices.